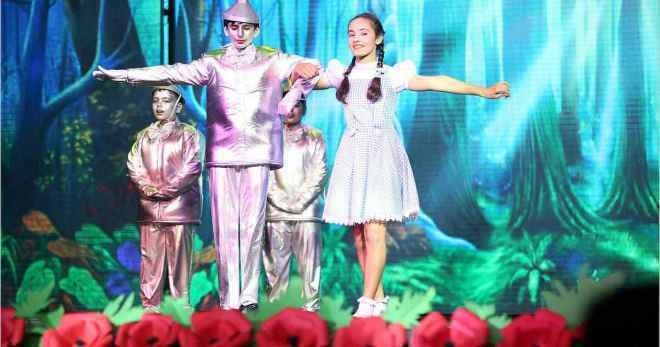 Showing off their histrionics on stage, performers from the Cambridge Secondary 1 programme recreated the fantasy-fiction The Wizard of Oz at the annual day celebration of GD Goenka World School, Sohna Road. The school celebrated the day at the Showshaa auditorium in Kingdom of Dreams, Gurgaon. The chief guest on the occasion was Prof (Dr) Shrihari, Vice Chancellor, GD Goenka University. The Occasion was also graced by the presence of Renu Goenka, Vice Chairperson, GD Goenka Group and other dignitaries from GD Goenka fraternity. The Programme commenced with the lighting of the lamp by Prof (Dr) Shrihari, Renu Goenka and Director-Principal Dr Neeta Bali, among others, along with a melodious rendition of the Ganesh Vandana. Following which, Dr Neeta Bali delivered the annual report highlighting the students' accomplishments and significant events of the school. The school choir performed Glorious, an inspirational song composed by David Archuletta. Strangers, the school band of the IB Diploma Students, also gave a riveting performance. These performances were followed by the School's solo soprano singer Sanjana, who sang the timeless classic O Holy Night, composed by Adolphe Adam in 1847. The most-awaited performance of the evening was the recreation of The Wizard of Oz, which was appreciated by all the spectators.